BBC - Travel - Did social media save this town? Did social media save this town? Thanks to a swell of attention on Instagram, a small town in the shadow of one of Turkey’s most famous sites is waking up and welcoming the world. Rising nearly 200m above the western rim of the Anatolian plateau in south-western Turkey, a stack of gleaming-white terraces cascades down the cliff, spilling into the Çürüksu plain below. Known as Pamukkale (‘Cotton Castle’ in Turkish), this petrified waterfall is actually a series of natural hot springs, whose calcite-filled waters bubble up through the ancient Greco-Roman spa city of Hierapolis, high above the hillside, before flowing down the slopes in a shimmering staircase of picturesque pools. Today, this geological wonder and the graceful mountaintop ruins of Hierapolis that once guarded it are Unesco World Heritage sites. Yet, while Pamukkale’s crystal-clear pools have become one of Turkey’s most-visited tourist attractions – with nearly two million visitors flocking to its glistening turquoise waters each year – the quiet 2,000-person town of Pamukkale at the bottom of the pools has long lived in the shadow of its famous namesake neighbour. Away from the petrified pools, Pamukkale has had the air of a dusty village for many decades. A collection of small brick and tile houses and diminutive grocery shops huddle around a mosque and small eateries. Goats peek out from fenced-in front yards up towards the busloads of bathers splashing up the hill, while farmers drive their tractors home after spending their days in the fields. Pamukkale's springs are said to heal skin and rejuvenate tired bodies, and their curative properties have long been known by the Greek, Roman, Byzantine and Turkish communities who have called the site home over the centuries. There are also more recent stories of how bathing in the springs can help ease ailments. In the 1950s in Northern Cyprus, a man named Ali Riza Cagin, still only in his early 30s, was suffering from debilitating joint pain and unable to work or stand for long periods. He travelled to the springs on his doctor’s advice and was able to return to work within a few months. Today, many doctors throughout Turkey still recommend those with eczema and rheumatic diseases to come here. 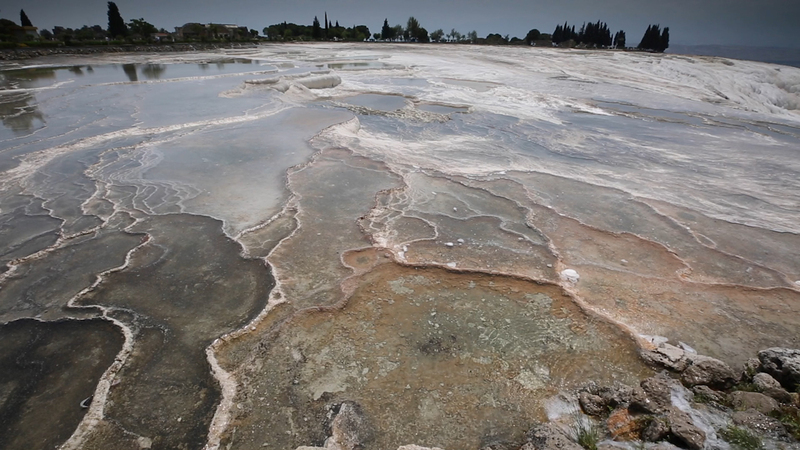 After Cagin’s miraculous recovery, word of Pamukkale’s restorative thermal waters continued spreading beyond the Anatolian plateau in the 1960s. Yet, the small town at the foot of the pools remained a sleepy settlement of pomegranate, grape and cherry farmers. But in the 1970s, the Turkish government began selling land along the Aegean and Mediterranean coasts to entrepreneurs in an effort to jump-start tourism throughout the country's south-west, according to Umit Bozdag, tourism spokesperson at the Turkish embassy in London. The coastal resorts started offering day trips to Pamukkale’s hot springs, and people came in droves. Seizing the opportunity, some Pamukkale residents took out loans and used any savings they had to build modest hotels and restaurants around the travertine terraces, and in the town below. As the number of visitors to Pamukkale grew, so did the damage to the area. Hotels financed by outside investors sprang up on top of the site at Hierapolis, destroying some of the ancient city’s ruins. Some hotels began taking hot water from the terraces to fill their pools, draining them in places, and effluent from septic tanks started leaking into water. By the late 1980s, Unesco was forced to intervene. Based on their recommendation, the government closed the road up to Hierapolis in 1990 and removed many of the hotels and structures on and around the thermal pools and ancient ruins. Visitors were also banned from wearing shoes on the travertine, bathing with soap in the natural thermals and traversing Pamukkale’s slopes on motorcycles. While the new measures helped restore the pools, the town’s economy was hit hard. Over the next decade, about three quarters of the roughly 200 pensions in and around Pamukkale closed. Government officials tried to compensate by investing in a slew of large spa-themed resorts near the pools, but instead of constructing them in Pamukkale, they were built 7.5km away in the village of Karahayit. In the five years before the government closed the road to Hierapolis in 1990, many residents left Pamukkale. Many found work in Karahayit’s luxury resorts or relocated to Turkey’s larger cities, while others, like Hakan Bozkurt, searched for work overseas. With not enough visitors coming to stay in Pamukkale itself, Bozkurt's father – like so many other residents – was forced to close his small pension hotel in 1996 and return to his fruit orchard. Things limped along in Pamukkale for more than a decade, until locals claim that an unlikely development helped reverse the town’s fate: social media. According to Bozkurt, as images of the town’s shimmering basins began spreading on Instagram and Facebook in 2011, a trickle of independent, more budget-conscious travellers started arriving. Unlike most bathers who arrived on buses on day trips from the coastal luxury resorts, many of these new visitors were looking to spend the night as close as possible to the cascading falls. This trickle soon turned into a stream, and in 2012, Bozkurt and his wife returned to Pamukkale to renovate and reopen his father’s shuttered pension. No internet meant not enough guests. Before we closed the hotel, we used to try to get people to stay here by standing on the main road from Denizli and stopping passing cars,” Bozkurt said. Pamukkale’s glistening white-rock thermal pools soon went viral, with publications around the world dubbing it an ‘Instagrammable' wonder, one of the world’s must-see social media ‘destinations’ and a ‘place to see before you die’. Today, a #Pamukkale search on Instagram reveals more than half a million results – mostly of young and beautiful tourists posing in the sparkling turquoise and white pools. Unlike in previous decades, Hierapolis and the pools are now tightly maintained and several areas are off-limits to visitors to prevent damage. According to Bozdag, social media has done more to revive the town of Pamukkale than any government-funded tourism initiative. "I could spend all day telling you about the beauty and restorative qualities of the waters at Pamukkale," he said. "But just one photograph will make you want to go there." The online splash has had a noticeable ripple effect on the eponymous small town. While Pamukkale still has the air of a humble farming community, a number of larger hotels and restaurants have recently sprung up around its edges. Specialist tour operators in the town centre offer trips to the pools, as well as the nearby vineyards in the Güney plateau, one of Turkey’s most famous wine regions; the ruins of Laodikeia, a tentative Unesco site and one of the seven churches named in the Book of Revelations; and the pine-forested mountains and waterfalls near the city of Denizli 17km away. Hot air balloons drift over Hierapolis daily at dawn, and a steady stream of paragliding instructors float over the pools and ancient city, offering aspiring daredevils a bird’s-eye view of the Unesco sites. Also, Pamukkale’s residents are increasingly welcoming visitors with local field-to-table specialties, a practice that is helping to ensure that family farms and age-old recipes are passed down to younger generations. Wander the town’s compact streets and you’ll see women like Ayşe Altintaş bake fresh spinach and cheese into gözleme flat bread. Local river trout seasoned with home-grown olive oil and lemons, lokum confections filled with hazelnuts, and local pomegranates are also popular. Ask Pamukkale’s residents and they'll tell you that the recent uptick in overnight visitors to the town has not only helped to increase jobs and preserve local traditions, but it’s also had a positive impact on the pools. According to Turgay Olmaz, who runs Pamukkale’s Hotel Hal-Tur, the more time people spend exploring the town and nearby attractions, learning about Turkish culture and “[meeting] real Turkish people who are going about their normal lives” – as opposed to simply bussing in for a quick splash – the less strain it will have long-term on the travertine pools. For as enticing as the powder-blue pools are, Olmaz argues that taking the time to also sit in one of Pamukkale's family-run cafes and savour a slow-brewed coffee, or watch groups of men playing backgammon, will ultimately reward visitors with a more meaningful travel experience. 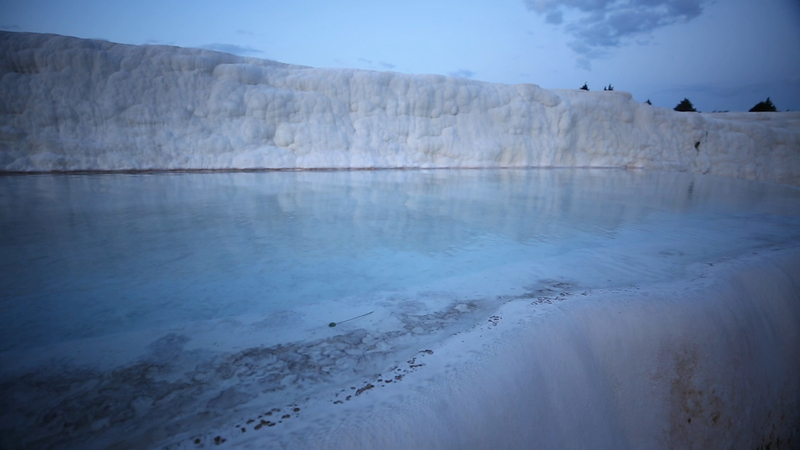 Pamukkale, he says, is a chance, for people to get to know “the real Turkey”.